Schwartz S, D Huang, and D Vladutescu. 2017. "High-resolution photography of clouds from the surface: Retrieval of optical depth of thin clouds down to centimeter scales." Journal of Geophysical Research: Atmospheres, 122(5), 10.1002/2016JD025384. Even thin clouds exert strong radiative influences that must be accurately represented in models. This study examines optical depth of thin clouds at unprecedentedly high resolution to examine this important cloud property at scales down to a few centimeters. This study opens new avenues to quantitatively characterize clouds at high spatial and temporal resolution. Clouds greatly affect the absorption and distribution of short- (solar) and longwave (thermal infrared) radiation and the transport of moisture and energy. It is essential that these cloud effects be accurately understood and represented in models. The present study uses the extremely high resolution of commercially available digital cameras to characterize clouds at unprecedentedly high resolution by remote sensing from the surface. A key cloud property, optical depth, the total amount of light scattering in a vertical column, is obtained as 3 million independent determinations in each of the red and blue channels of the camera over an area roughly 30 meters on a side in each image looking vertically upward from the surface, with successive images at 4-second intervals. 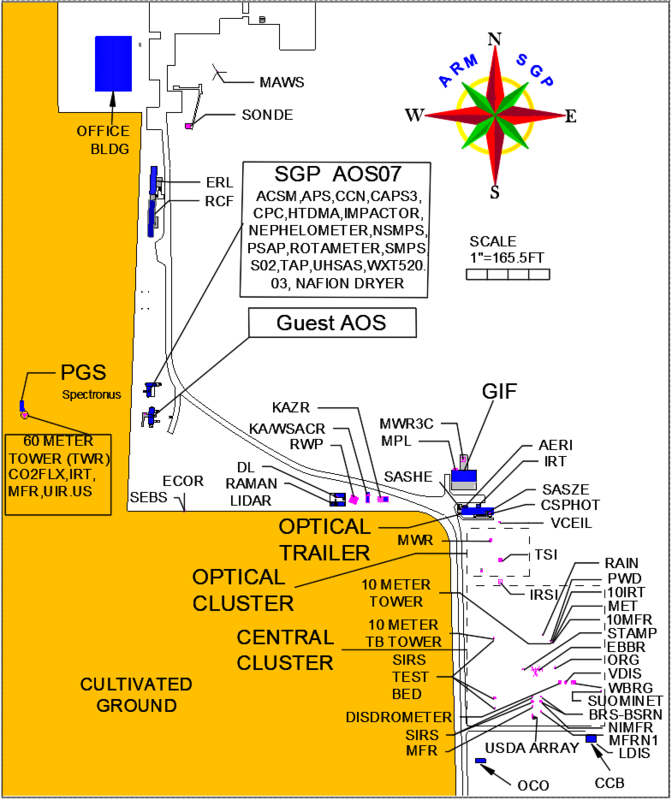 We commonly find considerable variation in optical depth within such a small spatial domain. This approach to remote sensing of clouds from the surface may lead to new means of characterizing clouds and atmospheric processes involving clouds, such as interactions of cloudy and non-cloud air by turbulent mixing. Looking up. High-resolution image, looking vertically upwards, of cloud at ARM Southern Great Plains site showing structure at scale of meters. Domain of image is about 30 by 40 meters. Thin cloud at high resolution. (a) Natural-color zenith image. (b) Cloud optical depth (COD) obtained from red-channel image, shown in false color. (c) Sub-region denoted by box in (a) and (b). (d) Sub-region denoted by box in (c). (e) Mean values of COD calculated over several 21-line profiles centered at indicated N-S pixel number bounded by pairs of horizontal lines in corresponding colors in (c). (f) Single-pixel line profiles of COD at N-S pixel number indicated by colors of lines in (d); uncertainty bar corresponds to ± 3 standard deviations of noise in retrieval of COD.